Pipe Swivels are female adapters featuring a nut with a straight thread captured on a 30º cone tapered gland. A seal occurs between the taper in the male fitting and the 30º cone tapered gland. 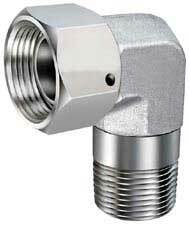 Pipe Swivels are for use with male tapered pipe thread hose fittings with a 30° seat. Pipe Swivels do not seal on the thread like most pipe threads, they seal on the nose of the swivel and the seat of the male tapered pipe thread. This creates a metal to metal seal. Pipe Swivels are recommended for use as an adapter to hose assemblies with male pipe thread ends only. Other methods of connecting tubing, pipe, or joining components should be utilized in system design. Seal Reliability Good in static & dynamic systems. Low tolerance to damage along sealing angles. Medium tolerance to thread imperfections.